The Outland Institute’s Northcote Correspondent, David Ashton, is watching all the AFI Best Film winners – so you don’t have to. In tinseltown, the Oscar for best movie went to Woody Allen’s Annie Hall. The highest-grossing movies of the year included Close Encounters of the Third Kind (dir: Steven Spielberg), Saturday Night Fever (dir: John Badham) and a family movie featuring a seabird in a prominent role… The Rescuers (dirs: Reitherman/Lounsbery/Stevens). The Cannes Palme D’Or that year went to the Taviani Brothers’ Padre Pardone. And yes – there was Star Wars (dir: George Lucas). Its impact was huge – in the short term we had a slew of second- and third-rate cash-ins (everything from Italy’s Star Crash to Disney’s The Black Hole). In the long term, Hollywood blockbusters – struggling to re-capture the audience exhilaration of Star Wars – began to resemble theme park rides more than movies. The enormous success of this movie (and others including Jaws and Raiders of the Lost Ark) meant that films previously considered juvenile B-pictures now got the big budgets and the marketing attention, while movies made for adults struggled on the margins. None of that mattered in Australia, of course, which had neither “big budgets” nor “marketing hype”. The Australian film industry was still renaissance-ing away with such diverse films as the animated Dot and the Kangaroo (dir: Yoram Gross, an unsung hero of Aussie film), Peter Weir’s spooky thriller The Last Wave, the nostalgic Picture Show Man (dir: John Power) and Lasse Hallstrom came here from Sweeeden to shoot ABBA: The Movie, starring That Guy That Played The Dad from Hey Dad (although since Hey Dad wouldn’t start until 1987, back then he was simply known as “That Guy“). Meanwhile Richard Franklin clearly believed he was on to a good thing as he delivered Phantasm Rides Again. On a sadder note, popular television soap operas Bellbird, Number 96, and The Box were all cancelled this year – it’s worth remembering that the successful film adaptations of No 96 and The Box played a not insignificant role in kick-starting the whole film renaissance thing in Australia. Written by Sonia Borg and Sydney L. Stebel, based on the novel by Colin Thiele. Directed by Henri Safran. 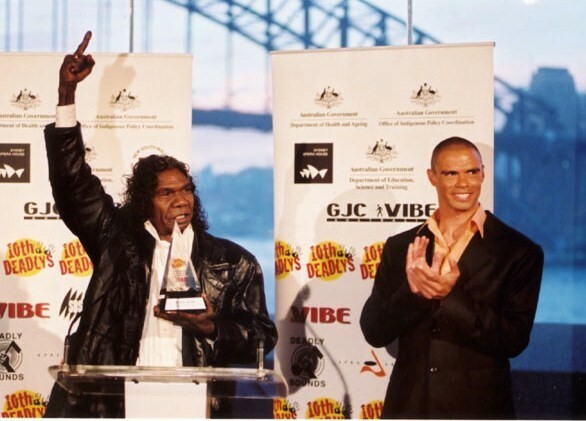 Starring Greg Rowe, Peter Cummins and Gulpilil as Fingerbone Bill. 10-year old Mike lives with his father Tom in a wooden shack near a wildlife sanctuary. Tom is happy with the isolation, but Mike is starting to wonder what he’s missing out on. He finds friends in an Aboriginal man living illegally on the sanctuary (like Tom, running from his past) and in Mr. Percival, a pelican he rescues when it’s parents are killed by poachers. Mike becomes the first child ever to run away to school, and Mr. Percival saves some fishermen from a sinking boat. Well it’s certainly beautifully photographed, but in an unassuming way which makes good use of the natural scenery and natural light. Despite Storm Boy’s minimal use of dialogue and low-key storyline the general feel of this film is warm and suitable-for-the-whole-family rather than Artsploitation. Like the previous years AFI winner, however, it falls into the “coming of age film” category, which will be a recurring theme in this series. Storm Boy was a big success in its day, and not just because the Colin Thiele novel was on school reading lists. Although it’s not usually included in the worthy canon of Great Australian Movies (Hanging Rock, My Brilliant Career, et. al.) when it is mentioned it’s usually prefaced with he words ‘Australian classic’ and is fondly remembered by those who saw it. What struck me about the film is that it’s a rare example of a film which can appeal to both adults and kids on the same level. Usually ‘family’ films feature simple storylines and cute characters for the kids, with the occasional sophisticated joke or pop-culture reference thrown in to keep the adults entertained. With Storm Boy everyone can appreciate the human drama – any child or adult who’s ever felt lonely, isolated or ‘different’ can relate to Mike‘s situation. While subtlety was the downfall of 1976’s The Devil’s Playground (which became rather bland), here the low-key approach leaves space for the film to touch on themes of ecology, indigenous relations and dysfunctional family without trampling on the drama. There’s enough space in the film for the viewer to take as much as they want from the film. I think anyone who sees this film will want a pet pelican afterward, although the scene where Mr. Percival rescues some fishermen from a sinking boat is perhaps a little too Lassie. Pelicans are closely related to boobies. In medieval Europe pelicans were a symbol of the passion of Christ. Pelicans mostly eat fish, although they sometimes eat smaller birds and (according to a popular urban legend) chihuahuas. Although Mr. Percival is the star of Storm Boy, Mike actually rescues three pelicans – the other two are whimsically named Mr. Proud and Mr. Ponder (very Michael Leunig). The three pelican ‘actors’ were Dum Dum, Carpenter and Sandwich. They were trained by Grant Noble for twelve months. Apparently the pelicans lived for a while in the swimming pool of the South Australian Film Corporation. Surely this was a boom time for filmmakers in Australia – not only did film funding bodies have their own swimming pool, but they actually offered practical help to people making films. Luxury! Greg Rowe was twelve when he starred in Storm Boy, and went on to star in another Colin Theile adaptation, Blue Fin (1978). He seemed to have retired from acting a few years later and now lives in Toronto, Canada. David Gulpilil (who is credited here just as Gulpilil) began his acting career when Nicolas Roeg cast the fifteen year old in Walkabout (1970). Prior to that he was already an accomplished hunter, tracker and ceremonial dancer and spoke several traditional languages, although not English. He has gone on to become one of Australia’s most distinguished actors, having worked with directors including Peter Weir (The Last Wave, 1977), Philip Kaufman (The Right Stuff, 1983), Wim Wenders (Until the End of the World, 1991), Philip Noyce (Rabbit-Proof Fence, 2002) and Rolf De Heer (The Tracker, 2002, Ten Canoes, 2006) as well as roles in Crocodile Dundee (1986) and as King George in Baz Lurhmann’s forthcoming Australia. Before his death in 2006 Colin Thiele wrote between 80 and 100 books (depending on who you ask) several of which were turned into films or television shows including Blue Fin (dir: Carl Shultz, 1978), The Fire in the Stone (dir: Gary Conway, 1984) and Sun on the Stubble (TV miniseries, 1996). Storm Boy seems to have been the peak of director Henri Safran’s career, although he did direct the miniseries A Fortunate Life (1985) as well as episodes of Space: Above and Beyond (1996) and Starhunter (2001). Next Time: They covered the action and shared the excitement… Newsline…um… Frontline… er…Frontnews? … oh, whatever. Do you remember Storm Boy’s original release? Did you want to have your own pelican? Leave your comments below! You can buy Storm Boy on PAL R2 DVD here: Storm Boy . Purchasing through this link helps The Outland Institute keep the dream alive. Other 1977 films you may enjoy include: The Woody Allen Collection – Vol. 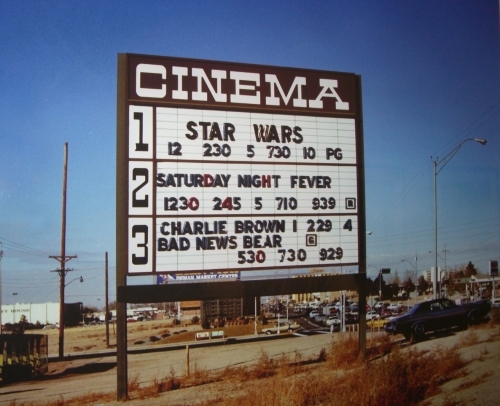 1 (includes Annie Hall & 5 others) , Close Encounters Of The Third Kind , Saturday Night Fever , The Rescuers , Padre Padrone , Star Wars – The Original Trilogy , Abba – The Movie . This entry was posted on Sunday, November 16th, 2008 at 7:11 pm and is filed under afi best film series, film. You can follow any responses to this entry through the RSS 2.0 feed. You can skip to the end and leave a response. Pinging is currently not allowed. Did you see Greg Rowe on “Where are they now”? He was on Sattelitte from Canada. Still seems to be an Adelaide Boy. So what does Greg Rowe do nowadays? What does he look like? Does he hang out with Gary Coleman and Macaulay Caulkin? 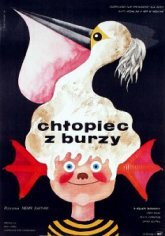 Storm Boy is a film I haven’t seen but always feel like I have. 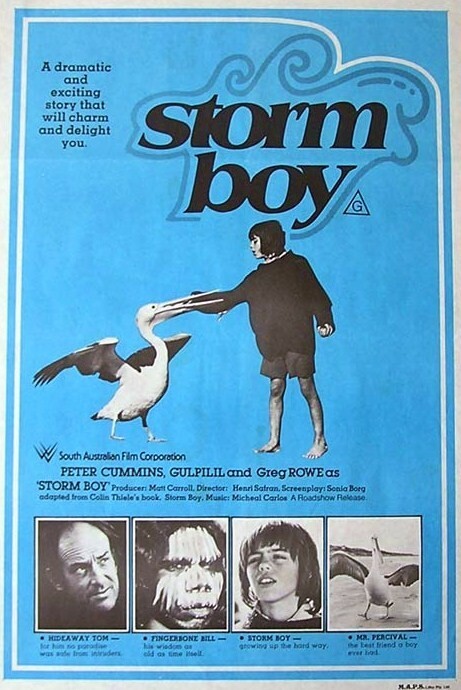 I seem to remember having Storm Boy product when I was growing up – that must’ve been the book, I can’t imagine the Aussie film industry being together enough to release merchandise. Were there Storm Boy t-shirts? 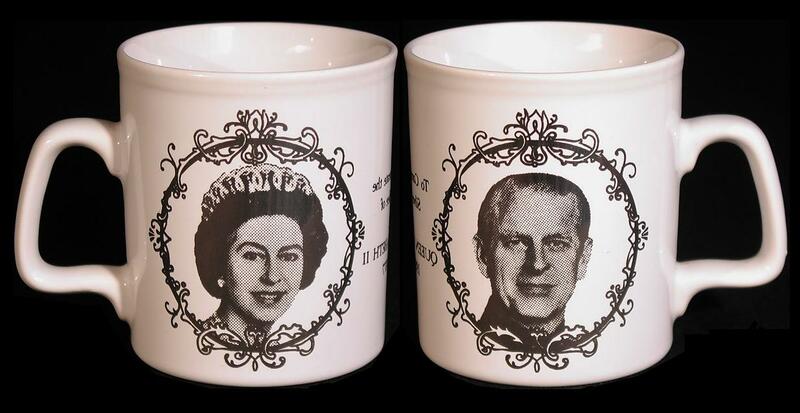 Commemorative mugs? Cuddly Mr Percivals? That might not be doing Storm Boy justice, but its enough to make me want to see the film. I do like pelicans. I haven’t seen Kes, although I’ve read the book oddly enough. I expect you’ll find Storm Boy is a bit lighter ad less angst-y. Also pelicans are cuter than kestrels. And kestrels aren’t related to boobies. I never really warmed to Storm Boy, because it felt like part of an assignment. Actually it *was* part of an assignment – we were reading the book at school in English class, and had to see the movie as a follow-up. 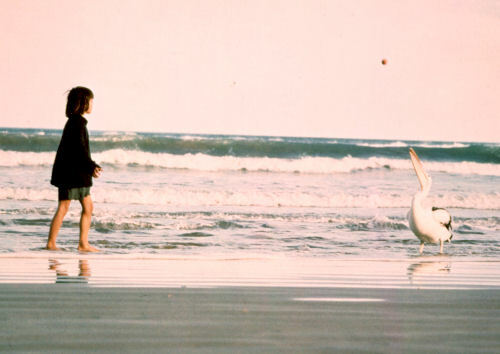 Well, I remember a kid on a beach with a Pelican and David Gulpillil being wise or something. I’m feeling a bit film illiterate at this point, not having seen either The Devil’s Playground or Storm Boy… I did see The Devil’s Backbone and Old Boy though… perhaps not quite the same thing… I hear Hollywood is remaking the latter. Did any of Victor Kelleher’s books ever make it to the big or small screen – he’s a children’s author I would have loved to have seen adapted to film, his Master of the Grove gave me the creeps as a kid. Sam: I also heard Hollywood is remaking Old Boy. Sadly, I heard it could be directed by Steven Spielberg and star Will Smith. At this point reality collapsed and I no longer believe anything I hear. But I still like pelicans. I loved it at the time, but don’t know if I want my memories ruined. Was Kes the the bird in Watership Down? No, Kes was the rat in Ben. He seems like a “top bloke”, as Ray Martin would say. I’ve gone back and included the Where Are They Now clip into the main article as well – it’s a good piece and includes more footage of the movie. This was, I think, the first film I ever saw in a cinema, so my inner 5-year-old will prevent me from ever saying a bad word about it. With the possible exception of the afore-mentioned Lassie-esque scene. Incidentally, I recently lent my copy to a friend whom I had previously loaned my copy of Kes. “It’s kind of an Australian Kes” I advised. To be fair, Thiele’s novel was from 1966, while the novel “A Kestrel for a Knave”, the source for Ken Loach’s film, was from 1968.